In January 2018, Komen Great Plains partnered with four hospitals in its region on a pilot program that offers a cold pack and breast health resources to those receiving a breast biopsy. The program is aimed at providing comfort to those facing a medical procedure while also making them feel good for taking care of their health and noticing a change in their breast health. Knowing what is normal allows someone to notice potential changes in his or her breasts. Thanks to our partners – Nebraska Medicine, Methodist Hospital, and CHI Health in Nebraska and Dakota Radiology in South Dakota — for working with us. 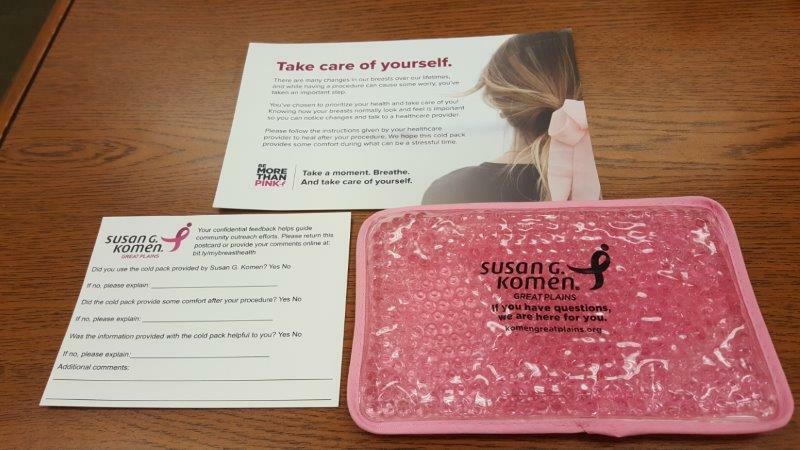 Select patients receive a packet with a cold pack that can be used to provide comfort following a biopsy, along with information about taking care of breast health and resources. Patients have the opportunity to provide anonymous feedback about the materials by returning a postcard with a self-addressed, stamped envelope. Jen, an RN from Nebraska Methodist Hospital’s breast center, talks about providing comfort to a recent patient after a breast biopsy.